Kind of tells you why it is failing in the Compiler Error Message so check your Web.Config. Find the section on <compilers> and check that is is correct. Recompile and all will be working again. And CPU hitting 100% due to VBCSCompiler showing multiple times taking loads of memory too. Close all instances of Visual Studio 2015 and if they don't do it automatically disappear, end tasks for all the VBCSCompiler processes. In your Visual Studio project under Bin folder you will see a roslyn folder (new for VS 2015). Delete the roslyn folder and all contents within. Restart Visual Studio 2015, re-compile your project and all should be well again. Install-Package : Too many automatic redirections were attempted. I noticed there was a update for Visual Studio 2015 NuGet Package Manage for Visual Studio to version 3.1.60724.766 (from current 3.0.60624.657), so I downloaded and installed it. Same errors. Once installed, open Visual Studio 2013 and connect to your TFS 2013 Server. OK all open pop up forms and save the *.wit file. Select the correct project and browse for the *.wit file you just saved. Once uploaded try to create a new Issue for that project and you will see that only the users selected in your TFS Group are now displayed (if you are using the Web abortion procedures TFS version make sure you F5 to refresh otherwise you will not see the changes). The Build Action was set to Build! 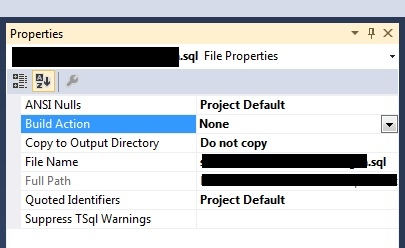 Installed SQL Server 2012 Management Studio on my local PC and found out in Visual Studio 2012 medical abortion pill I could no longer open a SQL Server Data Project. I kept getting the following error "Unable to open Database Project" from SQL Server Data Tools and both web links failed to bring risk of abortion pill up and solutions (infact they just 404'd). 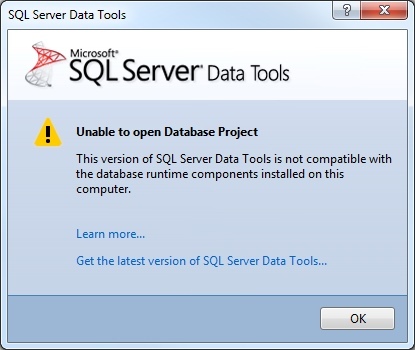 The fix was to install the SQL Server Data Tools - quite simple really?